Thursday October 9th 1890 Mother went to town early this morning and I sewed on my red waist and got it nearly done. Will was gone out to Dentons sale most of the day and it rained a little. Mother came just before right. John about the same. Friday October 10th 1890 I was busy with the work all the forenoon. Mother went to town. Will and I went over in the afternoon. I got me a new hat. John had a bad spell and Will went for Dr. Hobby. It was late when we got home. Mother came in a little while. Will went to town again after supper. Saturday October 11th 1890 Mother helped with the morning work before she went to town and I kept at it till nearly four oclock before I was entirely done. Tishie came over and stayed awhile. Mother come from town early. John is better. Sunday October 12th 1890 It was a hot day for the time of year and rained in the evening. Mother went to town about ten oclock and came back late in the afternoon. I had a ltitle time from the work to talk with Will and read and write. Monday October 13th 1890 I was busy about the house work most of the morning and Will took me over to town soon after dinner. It was a disagreeable afternoon. He saw Agnes Kelley and she promised to come to work tomorrow. John is a little better. 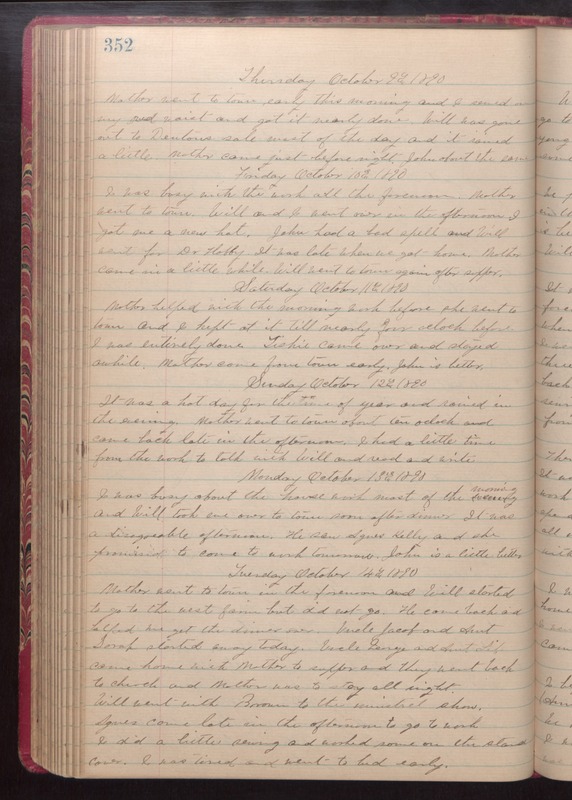 Tuesday October 14th 1890 Mother went to town in the forenoon and Will started to go to the west farm but did not go. He came back and helped me get the dinner over. Uncle Jacob and Aunt Sarah started away today. Uncle George and Aunt Lif came home with Mother to supper and they went back to church and Mother was to stay all night. Will went with Brown to the minstrel show. Agnes came late in the afternoon to go to work I did a little sewing and worked some on the stand cover. I was tired and went to bed early.